Do you want to look like this guy? You're in luck! Do you want to look like one of the fearsome White Walkers from "Game of Thrones?" This summer, some cool new products from Composite Effects (CFX) will be available to help you achieve the look of those baby-stealing zombie-like warriors with a new realistic collection. The Baton Rouge special effects studio will be creating this officially licensed line of silicone masks and prosthetics based on the "Game of Thrones" characters. Composite Effects (CFX) has signed a deal with HBO Global Licensing to produce a high-end line of hyper-realistic silicone masks and prosthetics based on creatures from the Emmy® Award-winning HBO series Game of Thrones. 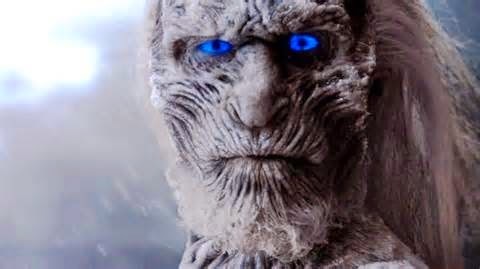 Making its debut early this summer, the first official line of Game of Thrones products will include screen-accurate White Walker silicone mask and glove sets from seasons 3 & 4, and a full White Walker Torso which, when worn together, will transform fans into the savage creature that stalks the northern reaches of Westeros. The suggested retail price will range from $640-$1590 for each individual piece, and from $1300-$2960 for a complete set. CFX is no stranger to props and masks. Their products have been featured previously in TV series and films such as; Treme®, 2 Guns, CSI: Miami, Universal Soldier: Day of Reckoning, The Campaign, Twilight: Breaking Dawn, The Last Exorcism, Smothered, and Search Party. Regarding the deal, Jeff Peters, HBO Global Licensing Director, states, "CFX has a well-deserved reputation for creating top-of-the-line masks and prosthetic pieces for hit series and films. When they approached us about creating a White Walker set, we were very impressed with their capabilities and instantly knew that they would deliver a product that Game of Thrones fans would be very excited about." Merchandise from "Game of Thrones" can be purchased here. The series is wrapping up its fourth season with only two episodes remaining. Fear not though, a fifth and sixth season has been confirmed.